The monumental task of removing scrap tires from the territory’s landfills recently became the subject of an unwelcome surprise. That was one of the revelations made by the Waste Management Authority’s interim director in District Court last week. WMA interim Director Tamara Albany-Nicholas testified at the scheduled compliance hearing to explain the steps the agency is taking to meet the terms of an eight-year-old federal consent decree. Nicholas made her first appearance before District Court Judge Curtis Gomez the morning after Roger Merritt III suddenly resigned as director of WMA. 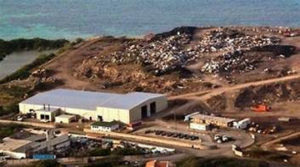 Wednesday was her third attempt to convince the court the agency was meeting its quarterly steps towards containing Anguilla Landfill on St. Croix and Bovoni Landfill on St. Thomas. Conditions at the two landfills worsened with the passage of Hurricanes Irma and Maria. Scrap metal was being baled and prepared for shipment off island. So were hundreds of thousands of scrap tires. But as crews cut up and baled 12,000 tires at the site and the area started to clear, thousands of undetected tires came into view. “Apparently brush grew over the tires and physically hid them from our routine inspection,” Nicholas said. The estimated undercount – 200,000 tires. A figure to be tallied along with 220,000 on St. Thomas and 200,000 more on St. Croix. “Am I to understand there are 600,000 tires, unbaled, territory-wide?” Gomez asked. “Yes,” Albany-Nicholas said. The agency is looking at ways to add manpower to the tire bailing and removal effort. As the talk turned towards Anguilla, Nicholas appeared stumped when the judge had a clerk project a timetable on the courtroom screen. That chart showed a Sept. 30, 2018 date for Anguilla to stop accepting solid waste. At first, the director said the date must be mistaken; but it was not. A few moments later, an admission: Albany-Nicholas erred by not keeping track of the date. In order to buy more time, Gomez said, the Federal Aviation Administration and the Environmental Protection Agency would have to agree to an extension. Talks between WMA and the FAA took place July 6. At that time aviation officials wanted more information about the management of foraging birds. Moments before the deadline for disclosure, Albany-Nicholas described the progress being made towards expanding the St. Croix landfill and to keep foraging birds out of the Anguilla transfer station. Sixty acres are proposed to be added at Anguila; 80 acres more for Bovoni. Because of its proximity to the Henry Rohlsen Airport, low flying birds pose a threat to flight safety. The bird situation had improved but was not fully under control, the director said. What did appear under control, among the unanticipated concerns, was vector control. Dr. Irene Guendel, an epidemiologist with the Health Department, said new reports of mosquito-borne ailments were down in the first half of 2018. Her testimony offered some support to the director’s assurance to the court that scrap tire piles were regularly sprayed for insects. “For 2018, we have had a total of two cases,” Guendel said of the latest vector borne health concern, Zika. “The last reported infection involving a pregnancy occurred in October 2017. Seven cases of Dengue fever were reported to Health over the same time period, she said. There were no reported cases of the painful joint ailment, chickungunya. Less assuring for the court was WMA’s resources for taking care of the problems. “The financial situation is strained at the authority,” Nicholas said. Gomez told the director he wanted agency officials to come equipped with concrete plans for taking care of its compliance steps in time for the next scheduled hearing. Tawana doesn’t know what she is doing.